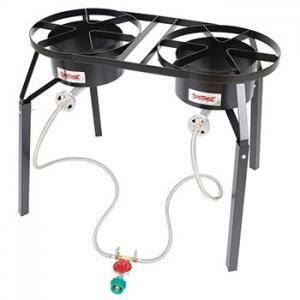 Extenson Legs Raise Unit to 25"
Dual high pressure burner cooker features dual 14 In. diameter cast iron cooking surfaces, 360 degree windscreen protection, wide leg design for stability, 10 psi regulator with dual brass control valves, and dual 36 In. stainless braided hoses. Extension legs raise height to 25 In. Perfect when entertaining large groups of people and ideal for crawfish boils. Bayou classic outdoor cookers are the traditional and reliable choice for outdoor cooking. They are portable and can be used for camping, rv's, tailgating, and backyard parties. With a one-piece welded steel frame, these are the strongest cookers commercially made. Designed for strength, function and safety.